We recently had family in town who were unfamiliar with Annapolis, so we decided to play tourists! We've seen the Red Trolley going around town, and thought let's go see what that is! FARES The fare for adults is $18; Active Military and young adults aged 11-15 are $9, children 10 and under are $3. Preschoolers are free. If you live in Anne Arundel County, and if paying customers have not filled the trolley, the tour is free! Please present a drivers license showing county residency. Your guests also receive a dollar off the regular fares. 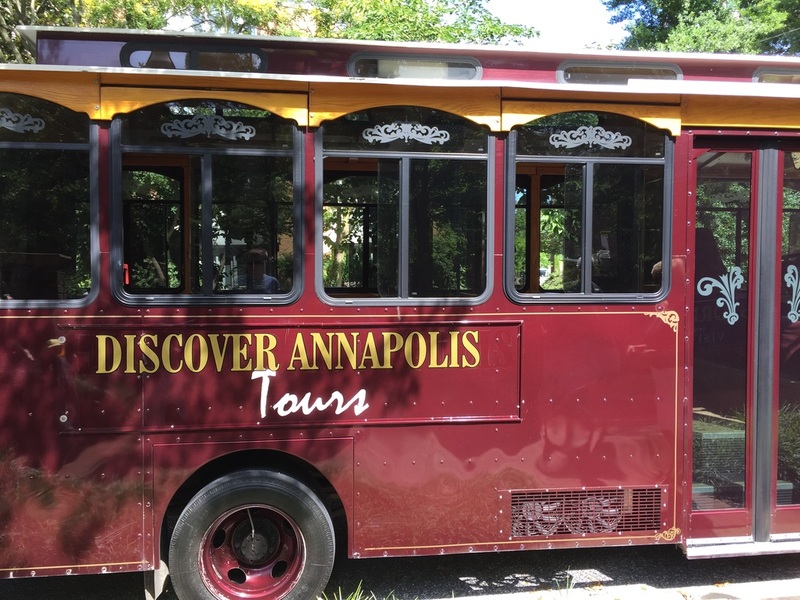 Join us on a trolley tour to explore the back streets, marinas, and points of interest in Annapolis—colonial seaport, state capital, county seat, sailing center, and home of the United States Naval Academy! You'll learn all about the academic and althetic programs at the United States Naval Academy as we view its beautiful grounds from the spectacular vantage point of the Severn River Outlook. You'll also learn about the almost 1300 buildings in Annapolis that are over a century old, and which represent 15 different styles of architecture. We'll pay special attention to the harmonious and balanced Georgian style, using numerous examples to showcase it—Annapolis has the highest concentration of Georgian buildings in America! We even saw this gear stuck in the parking lot over in Eastport, and I've seen it but never really knew what it was. Apparently back in the day, they would pull the boats in with these big wenches, and this was leftover from those times. All in all, we'd definitely take visitors on this 1 hour tour. It covered so much material, that all of us thought we could have done this tour, only a longer version!